This article has also been published on my German blog. Dieser Artikel wurde auch auf Deutsch veröffentlicht. I often hear great things about cycling in Berlin. Apparently there are “ubiquitous grade-separated cycle tracks, bicycle boulevards, and other facilities“, which mean that “you can get round most of Berlin on segregated bike paths“. According to this Lonely Planet guide book I have here, “the biking infrastructure is fantastic“, and Stephen Evans of the BBC found “endless cycle tracks” (where are they, Steve?). I really wish all this was true, but unfortunately it’s nonsense. Berlin is definitely second-rate for cycling. I often find myself wanting to go somewhere within cycling distance but having to choose to use a different mode of transport, because the conditions for cycling there are too unpleasant for me or the people I’m with. 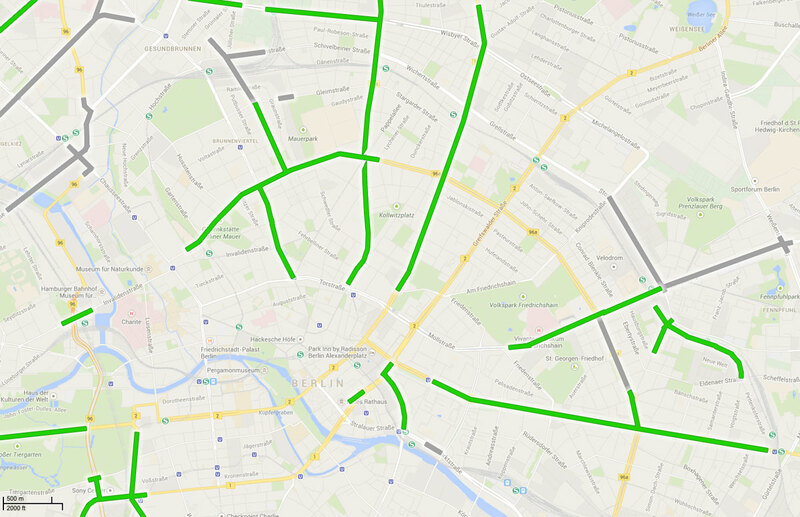 So with this in mind, I made a map of Berlin’s cycleways. And I’ve been extremely generous in my definition of “cycleway” here. Nothing comes close to the criteria set out in this article. I may have missed a few little bits off, but I think I got all of it. Only people with mountain bikes may overtake here. …so don’t go thinking that I’m being harsh on Berlin here. If anything, I’m being too kind for including those on the map. One of Berlin’s better (but still not good enough) cycleways. Just enough room to squeeze past in the door-zone. Keep alert at junctions! Everything else is either a painted lane on the road or nothing at all, and like most people I’m not willing to mix with motor vehicles along fast, wide, busy roads. The map covers the part of Berlin where I live and spend most time – the central north and east areas – but the picture is pretty much the same elsewhere in the city. Some areas are better than others, but not much. I was considering adding some of the back streets on this map too, but I couldn’t think of any that were really suitable. On the whole they’re either too busy with traffic to be serious contenders for being part of a cycle network, or they’re surfaced in the rough cobbled “Kopfstein” that make cycling a pain in both the physical and metaphorical sense of the word. At least there are no buses around here, just trams, though bad street design means that they can be dangerous too (the subject of yet another post to come). But as you can see from the map, travelling by bike in Berlin can be a real pain unless you’re happy to mix with cars, vans and lorries on multi-lane roads. Be my guest. I’ll walk. And how should it look? My dream cycleway..